Before you take off to Carihuela on a whim, take the time to learn a few facts about it. Carihuela is a neighborhood in Torremolinos. To get there, travel 1 mile (2 kilometers) to the southwest of the downtown area. Last time they counted, the population of Torremolinos was 65,000. Arrange your Carihuela flight and accommodation package via Travelocity, and keep more money in your pocket. With upwards of 400 airlines and 665,000 places to stay, you've got all the freedom in the world. Our Customer 1st Guarantee provides 24/7 personal assistance on everything from flights and accommodations to activities and rental cars. Have you come across an even better bargain? We'll match the price and reimburse the difference^. We'll never charge you any hidden fees for altering or canceling your package bookings. And as long as you get in quick, most accommodations won't charge a fee either^. Are you looking to lay your head in Carihuela? You'll find some fabulous lodgings just a walk away. Select from 61 accommodations and then start organizing your must-see list for this neighborhood! From time to time, we all need a little bit of luxury to make us feel special. If you're searching for some upmarket accommodations around Carihuela, browse the Vincci Selección Aleysa Hotel Boutique & Spa (Av. Antonio Machado, 57) and the Sol House Costa del Sol (Calle de Salvador Allende 45). Their soft beds and lush little add-ons will make you wish you could stay there forever! 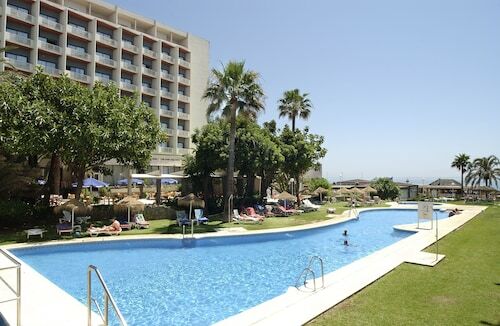 However, if you're more interested in spending your cash on experiences and activities than on somewhere to stay, have a look at the La Luna Blanca (Pasaje del Cerrillo, 2) or the Mac Puerto Marina Benalmadena (Avenida del Puerto Deportivo, s/n). Where do you fly into for Carihuela? Pack your bags and get set for a spectacular adventure. The moment you touch down at Malaga Airport (AGP), you'll be just 5 miles (8 kilometers) north of Carihuela. Can I rent a car in Carihuela? No matter if you're traveling to Carihuela all by yourself or with a bunch of buddies, it's always better to have a ride. Travelocity offers many car rental options, so select one now and start creating your road trip playlist right away! Collecting a vehicle straight from Malaga Airport means that you don't have the stress of transfers and cabs. Avis and Ace are both a short distance away. Pick up your rental vehicle in the heart of the city and you'll be navigating the busy streets in a flash. The best outlet here is Europcar at Avda.Palma De Mallorca N.65. We're all fond of feathered and fuzzy critters, but how about spending some time with those who are a little more scaly and slimy? You can encounter a few of the most interesting occupants of the underwater world at Sea-Life. Need more close by options? La Bateria Park is a welcoming place to chill out in if you're exhausted from roaming around town. Find a bench, sit yourself down and rest your weary legs. And that's not all. Get set to walk on the wild side! Take the family to Crocodile Park and watch the kids' faces come alive as they encounter some of the marvels of the animal kingdom. Torremolinos City Centre and Calle San Miguel are well worth a visit while you are in Carihuela. 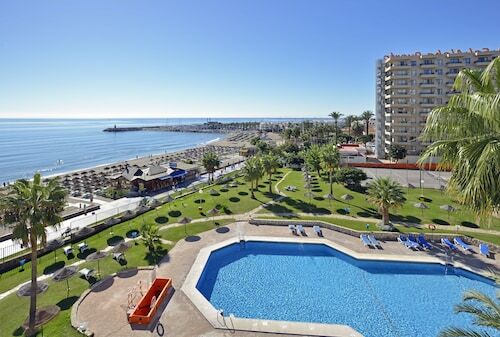 Torremolinos City Centre is 1 mile (2 kilometers) away, and Calle San Miguel is 1 mile (2 kilometers) away. Nestled on the beach, this Carihuela apartment building is within a 10-minute walk of El Saltillo Beach and La Carihuela. Benalmadena Marina and Sea-Life are also within 1 mi (2 km). El Pinillo Station is 15 minutes by foot. Located in Carihuela, this spa hotel is within a 15-minute walk of La Carihuela and Bajondillo. Los Alamos Beach and Sea-Life are also within 1 mi (2 km). El Pinillo Station is 14 minutes by foot and Torremolinos Station is 25 minutes. Nestled on the beach, this Carihuela hotel is within a 15-minute walk of La Carihuela and Bajondillo. Sea-Life and Los Alamos Beach are also within 1 mi (2 km). El Pinillo Station is 12 minutes by foot and Torremolinos Station is 27 minutes. 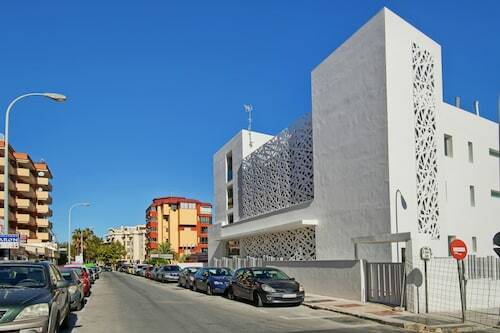 Located in Carihuela, this golf apartment building is within a 10-minute walk of La Carihuela and Bajondillo. Aqualand Torremolinos and Benalmadena Marina are also within 2 mi (3 km). El Pinillo Station is 14 minutes by foot and Torremolinos Station is 22 minutes. Located in Carihuela, this beachfront hotel is on the boardwalk and within a 10-minute walk of El Saltillo Beach and La Carihuela. Benalmadena Marina and Sea-Life are also within 1 mi (2 km). El Pinillo Station is 19 minutes by foot. Located in Carihuela, this aparthotel is within a 5-minute walk of El Saltillo Beach and La Carihuela. Benalmadena Marina and Sea-Life are also within 1 mi (2 km). El Pinillo Station is 17 minutes by foot. Nestled on the beach, this Carihuela hotel is within a 15-minute walk of La Carihuela and Sea-Life. Benalmadena Marina and Bajondillo are also within 1 mi (2 km). El Pinillo Station is 19 minutes by foot. 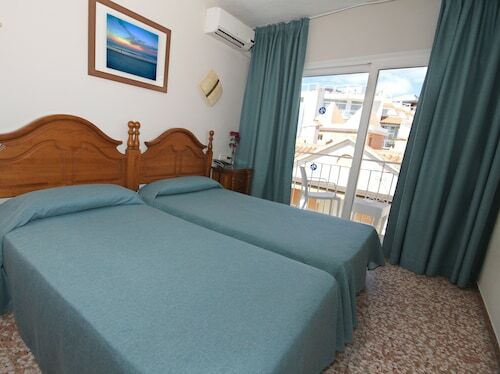 Located in Carihuela, this beach hotel is within a 5-minute walk of La Carihuela and Bajondillo. Aqualand Torremolinos and Benalmadena Marina are also within 2 mi (3 km). El Pinillo Station is 18 minutes by foot and Torremolinos Station is 20 minutes.